We supply, fit and maintain many types of automated gates. Below are a few examples of our most popular models. Sturdiness and power are its strong points. Two versions for leaves up to 3m and 5m. 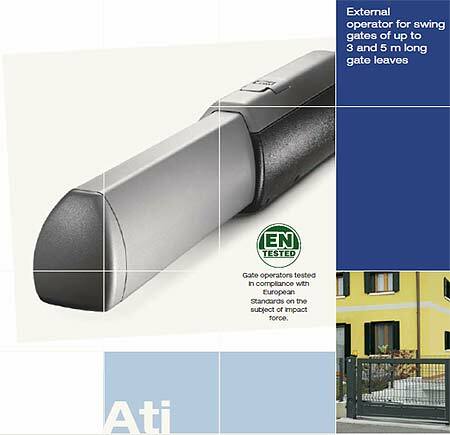 Ati is the perfect operator for medium to large residential gates. Powerful and versatile; it can also be used under intense duty conditions such as in apartment blocks, company facilities or other multi user environments. The totally automated hidden automation system that emphasises your entrance. 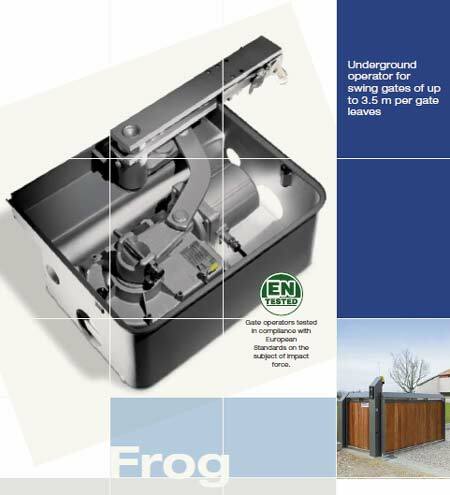 Frog represents the synthesis of CAME’s design philosophy and creativity applied to swing gates. Extremely sturdy and all but invisible, the system in no way detracts from the aesthetics of your entrance. Security Systems Maintenance Ltd., Bridgewood House, Pluckley Road, Smarden, Kent, TN27 8RE.